The Wonder Two Tone Engagement Ring is set with a Round Cut center stone in a halo with a twisted diamond infinity style band. This ring has a matching contour fit wedding band curves perfectly around the halo and twists on the band for a flush fit. Starting price is for setting only. You receive a discount off the band when purchased with the engagement ring. Side Stone Carat Weight: 0.64ct. - 0.75ct. 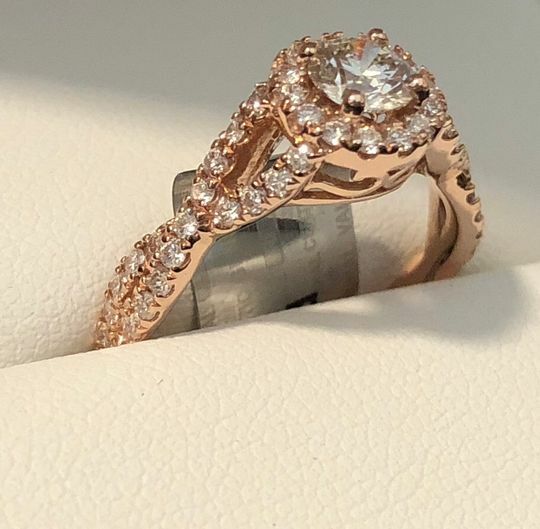 Tim G. Reviewed by Tim G.
This ring sparkles from any angle and the modern design sets it apart from other plain band rings. My fiance loves this ring so much!